It’s not really question of whether IBF light heavyweight champion Bernard Hopkins (53-6-2, 32 KO’s) will beat his little known German based opponent Karo Murat (25-1-1, 15 KO’s) tonight in Atlantic City, New Jersey. The only question is whether the 48-year-old Hopkins will look sensational in stopping him or as boring as he’s looked in many of his fights over the years. Either way, Hopkins will win this fight with ease. Murat has one defeat on his record, but he should arguably have three defeats because he draw and victory over Gabriel Campillo in their two fights were fights that Murat appeared to lose. Murat was also stopped by Nathan Cleverly several years ago in one-sided match. Murat resembled a punching bag for 10 rounds and it was awful fight to see because it should have been stopped by the 6th round due to Murat absorbing so much punishment. The IBF decided to rank Murat anyway despite his poor performances, and so we have a mismatch tonight between Hopkins and Murat in a fight that will be televised by Showtime. Hopkins wants a super fight against Floyd Mayweather Jr., and he’s even willing to drain down from 175 to meet Mayweather at 160. The chances of Hopkins ever getting that fight are about zero. Mayweather isn’t going to fight what would be a 49-year-old Hopkins for many reasons, starting with the huge size advantage that Hopkins would have in such a fight. There’s no point in Mayweather agreeing to fight a less popular fighter like Hopkins and coming up to the middleweight division to take the fight. My guess is even if Mayweather were to agree to such fight, Hopkins would likely have to agree to come down to 154, and I don’t think he could do it without draining himself so badly that the fight would be a farce. Hopkins’ only chance of a super fight will be for him to agree to face WBC light heavyweight champion Adonis Stevenson in Montreal, Canada. The fight would sell well over there and it would do well on Showtime. That’s not a good match-up for Hopkins though and he’d likely lose by a one-sided 12 round decision or get knocked out. 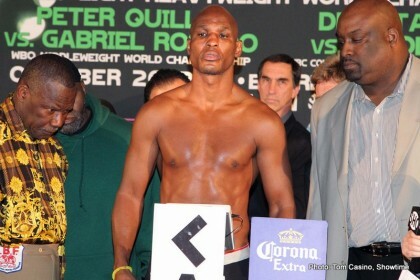 It’s going to be a tough decision for Hopkins to make whether to take the fight with Stevenson or not. If Hopkins agrees to the fight, he’ll be signing for a sure thing loss. He’s not going to beat a fighter like Stevenson, not at his age. To be sure, Hopkins can still beat the likes of Murat and Tavoris Cloud, but he can’t beat Stevenson. Hopkins could also fight WBO light heavyweight champion Sergio Kovalev, but that’s also a fight where Hopkins would lose. It’s not a fight that would attract as much interest as the Hopkins-Stevenson fight because Kovalev isn’t backed by a huge country like Stevenson is. It wouldn’t be a winnable fight for Hopkins because Kovalev throws a lot of punches and he would badly outwork Hopkins and possibly stop him. If Kovalev didn’t get the stoppage, he’d definitely give Hopkins a real beating for 12 rounds. It would likely be a boring fight with Hopkins circling the ring for 12 rounds and jumping in to land one punches followed by a clinch. Kovalev would have to chase Hopkins around the ring and there would likely be massive amounts of clinching on Hopkins’ part. Without a referee to control the clinching, we’d likely see a dull fight, but one that Hopkins would surely lose. Previous boxing news: Povetkin vs. Klitschko at the 2016 Olympics in Brazil?